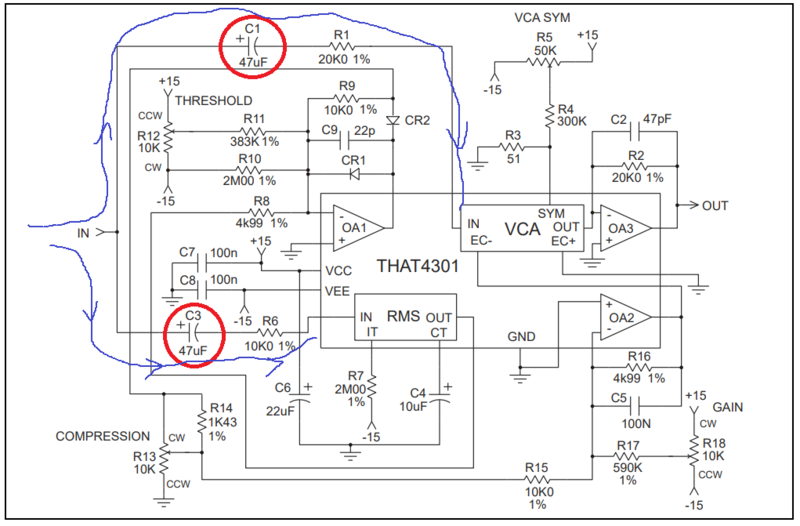 How to avoid a electrolytic capacitor on a (audio) signal path? The capacitor above is a polarized type. The signal is not biased before. As far as I know, this is a bad use. I also verified my concerns with a simulation. If the signal really containts a negative DC (which this cap tries to avoid) the cap would/should fail or blow. So I want to replace it with a polarized type. 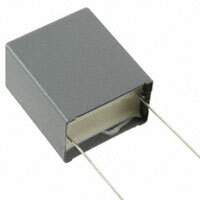 However there is not really a good/small capacitor with such a high value, so I also would like to decrease its value. My circuit works with 10u and I cannot detect any cutoffs in the LF-Response. Still a big cap in the signal path. I cannot calculate properly the value of this AC-coupling cap because I cannot find the input impedance of VCA (Voltage controlled amp) in the datasheet. 47u would be necessary to pass a 10Hz-AC-Signal if the load had 330 Ohm input impedance! Isn't this freaking low? Can anybody read the input impedance out of the other values in the datasheet? Why are they recommend a polarized capacitor for a non-biased input? I've seen this also in wikipedia (also frequently mentioned here). What kind of possibilities do I have to avoid such big AC-coupling capacitors in the signal path? The input is virtual earth (It is basically the inverting input of an opamp buffer, so the time constant is defined by R1 or R6 depending on the channel. I would possibly use a non polar part there, but really the trick with electrolytic caps as DC blocks is to make them large, a cap forming a pole way below the audio band has by definition little signal voltage dropped across it and thus contributes negligible distortion. Obviously a cap forming a pole in a filter network (Something like a passive crossover) has issues, but for small signal DC block a non polar elco is generally fine. There is a LOT of crap talked about capacitors, and it IS possible to use the wrong ones in the wrong applications, but a non polar elco there will do just fine in practice. C. Bateman did the classic work on this stuff back in the day in a series of articles in E&WW, well worth tracking down. As mentioned in the section on theory, the VCA input pin is a virtual ground with negative feedback provided internally. An input resistor (R1 , 20k\$\Omega\$) is required to convert the ac input voltage to a current within the linear range of the 4301. A small amount of reverse voltage is just fine on a regular polarized wet electrolytic capacitor; it won't "blow" with a few hundred mV of reverse voltage. There is an anodic film on the opposing electrode, it just isn't as thick. Or you could use a multilayer ceramic capacitor with a reasonable dielectric (eg. X7R or X5R, you can't get NP0 in that size realistically), eg. TDK C5750X5R1C476M230KA which would be relatively small and somewhat cheaper but there might be concerns about introducing a microphonic part in the signal path. Alternatively you could (say) use an input voltage 10x higher and increase R1 to 200K, and reduce C1 to 4.7uF, which is a relatively reasonable size for a film cap. But I would suggest just using the inexpensive and perfectly suitable 47uF polarized electrolytic cap the manufacturer recommends. You probably want something that behaves reasonably linearly- while the capacitor won't have any effect on audible signals when the cutoff frequency is chosen properly, if there are sub-audible frequencies present near the cutoff the harmonics could be audible. That would tend to point against ceramic caps, which have a large voltage coefficient. Film and electrolytic caps are fine. Not the answer you're looking for? 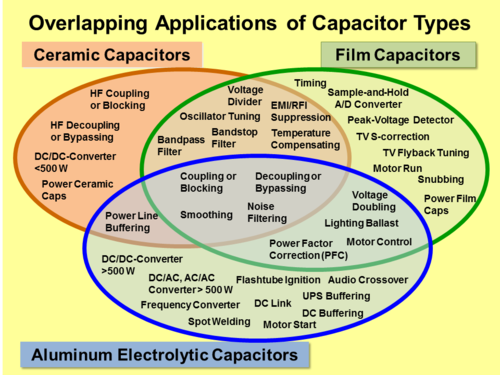 Browse other questions tagged capacitor audio electrolytic-capacitor or ask your own question. Can you make a non-polar electrolytic capacitor out of two regular electrolytic capacitors? Will an electrolytic capacitor work reliably with 0 VDC and 100 mVAC? What determines the orientation of a coupling/blocking capacitor in an amplifier circuit?